Four wellness trends pop out of the latest survey research on employee benefits from the Society for Human Resource Management. A year ago, all the talk was about outcome-based financial penalties to tame the threat of obesity. Now reality is taking hold. Carrots seem to have more staying power than sticks. Health and Lifestyle Coaching. 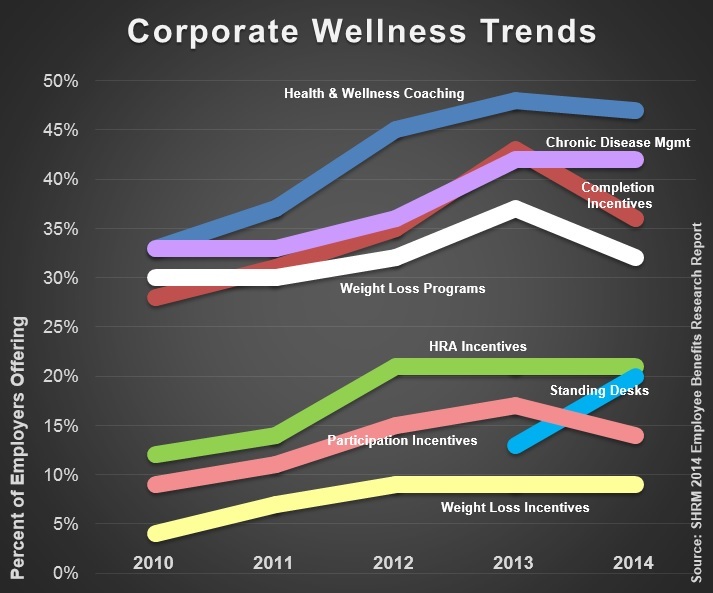 Between 2010 and 2014, the number of employers offering health and lifestyle coaching services to employees grew significantly. Of all the benefits with potential to address obesity, it is now the one that is most commonly offered. Chronic Disease Management. Prevention programs designed to help employees with chronic health condition grew steadily over the past four years. Now 42% of employers offer such a benefit. As models for managing obesity as a chronic disease mature, real progress will be possible. Outcome Incentives. The notion of providing monetary incentives for successful completion of a wellness program was hot a year ago. But then employees and privacy advocates started pushing back and some employers scrapped this idea. Standing Desks. Out of nowhere, the idea of providing a standing desk has become this year’s hot ticket. Given all the data on the health hazards of sitting, this trend bears watching. Click here to read the full report from SHRM and click here to read more from ConscienHealth.